Here comes King of the Monsters… swimming! Color variant of Godzilla in the 1989 Godzilla vs. Biollante movie. Don't miss this exclusive Sofubi vinyl figure! Handcrafted limited edition of just 100 pieces! Entertainment Earth Exclusive! 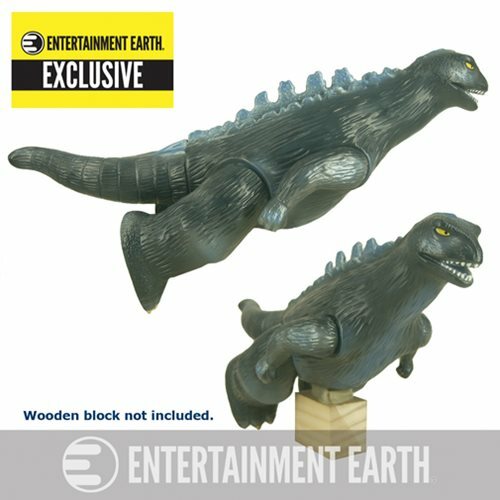 This handcrafted, hand-painted Godzilla Vinyl Wars Godzilla Swimming 1989 Sofubi Vinyl Figure - Entertainment Earth Exclusive, inspired by the designer toy movement, will hold a place of honor in your collection. Godzilla's appearance in the 1989 Godzilla vs. Biollante movie is stunningly captured in this variant colorway, boasting colors ranging from a light gray body to his light blue scales! The Godzilla Vinyl Wars Godzilla Swimming 1989 Sofubi Vinyl Figure - Entertainment Earth Exclusive is a limited edition of only 100 pieces and stands about 9-inches tall. Don't miss it! Ages 15 and up. Godzilla: Vinyl Wars is a collaboration between Japan's classic Sofubi manufacturers and cutting-edge toy maker Medicom Toy. Wooden display block not included.